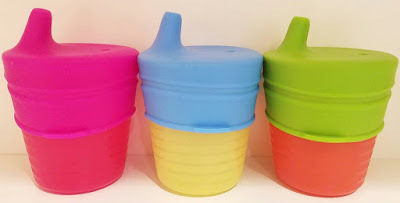 Love these sippy cup tops which can fit on many cups, cans, and bottles to instantly turn them into sippys for the little ones in your life. Very easy to clean and use, just stretch slip on and hand to your child. Great for road trips, or everyday use. Bold colors that can also teach your child colors. I just soak ours in soapy water then rinse and air dry. 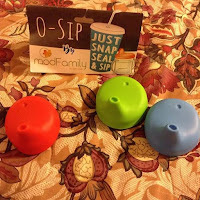 The O-sip silicone sippy lids can be found on Amazon. What O-sip has to say about their product. Attention Parents! Are you ready for your child's cups to always have a lid...wherever you go and whatever cup they use? Sound impossible?Introducing O-Sip: A spill-proof drink lid that fits over virtually any cup or glass. Simply stretch the lid over the top of one and voila-a spill-proof sippy cup! Perfect for the little "Butterfingers" in your family. These lids are great for families at restaurants, too-no need to bring along a sippy cup. Use O-Sip and turn the restaurant's glass into one.